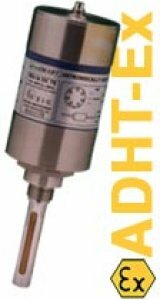 The Alpha Moisture Systems Model ADHT-Ex is a 3 wire, 24V powered 4-20mA dewpoint transmitter. The unit is fully self contained in a robust casing with weatherproof protection to IP65, making it ideal for use in heavy industrial environments. Designed with the operator in mind, Model ADHT-Ex is extremely easy to use and the digitaldewSMARTtechnology ensures accurate and reliable readings with little or no maintainance. Model ADHT is certified intrinsically safe to EEx ia IIC T6 for use in hazardous areas using an MTL 2441B signal isolator for 110V / 240V AC operation or MTL 5042 for 24V DC operation. Various ranges are available covering an overall range from -110ºC to +20ºC dewpoint. The Model ADHT-Ex derives its power directly from the signal isolator and it is configured to give a linear 4-20mA signal for the chosen range.